The Arduino robotic arm will look and act great on any desktop! 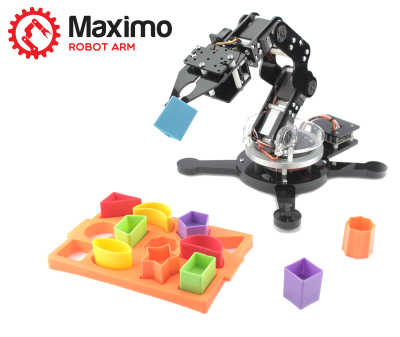 Maximo is an Arduino-driven, 5-axis robotic arm with a laser-cut acrylic body. The robot comes with Robotic Studio software and can be controlled using a gamepad. Maximo will also play through a series of recorded steps, executing complex automations. Only a screwdriver is required for the assembly or it can be sent fully assembled. Another great advantage of Maximo’s design is the head of the arm, which can be changed within seconds for another module. The regular claw is a gripper included with each robot. A more sophisticated gripper head module allows Maximo to grab objects by applying balanced pressure. The palletizer head module is a miniature reproduction of the ones used in factories and warehouses. The pen-holder module allows various objects to be placed on Maximo’s head (pen, laser pointer, drumstick, etc.). About InnoTechnix: Launched in 2011, InnoTechnix inc. has developed a variety of robots, robots arm, custom gripper, talking robots, intelligent clocks and mobile robots. InnoTechnix takes care of both the design of robots, manufacture of parts and development of robotics software. InnoTechnix Robots have appeared on television shows like Dragons’ Den, Mr. Net, Main Entrance, Cogéco TV and a television commercial for the Ford Focus. Dieser Eintrag wurde veröffentlicht in Crowdfunding, Development, English, Hardware und verschlagwortet mit Arduino, Kickstarter, Maximo, Robot-Arm von Sebastian Trella. Permanenter Link zum Eintrag.